For some years after the end of the First World War the memoirs of generals and statesmen dominated publication about it – none more prominently than Churchill’s great classic, The World Crisis (1923). Then, quite suddenly, ten years down the line, came the other side, the horror, the view from below. The British had lost almost a million men dead, the French over a million, and the Germans nearly two, mainly on the Western Front, where thousands of guns churned up the mud. War cripples hobbled the streets of Berlin, and are recorded in the bitter Twenties paintings of Georg Grosz and Otto Dix. Writers followed – in Great Britain, amongst the earliest books were Richard Aldington’s novel Death of a Hero (1929) and Robert Graves’s memoir Goodbye to All That (1929), the most famous of them all. I was given it as a Christmas present when I was fifteen and read it at a session. At the time, the mid- Fifties, there were men around, not even sixty, who had gone through the Western Front but you could never get them to talk about it. British critics did not attack ‘the system’, they tended to dwell on the incompetence of the generals. The French had a rather similar experience, in that the from-below story of 1914-18 surfaced with Louis-Ferdinand Celine’s Voyage au bout de la nuit (1932), which is brilliant black farce. Celine, who had volunteered in 1912, entered the War with the usual young man’s patriotism, and was badly maimed at an early stage; and he made a mockery of the whole business. But there is not really any French, let alone British or American, equivalent of the bitterness and edge that went into the paintings of Dix and Grosz. Two films come the closest – Oh! What a Lovely War (1969) which started off as a musical (1963) by Joan Littlewood based on the songs of the poor bloody infantry, and Stanley Kubrick’s Paths of Glory (1957). 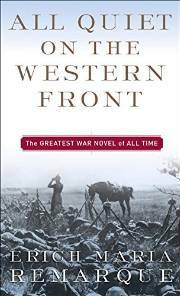 On the literary side, the German Erich Maria Remarque’s All Quiet on the Western Front (1929) is in a class of its own. It appeared not long before the Wall Street Crash started a process that was soon to give Germany eight million unemployed, and the Chancellorship of Adolf Hitler. Not just the Nazis banned it; so did the Lord Mayor of Cologne, Konrad Adenauer, a Centre Party Catholic and later first Chancellor of West Germany. Official Germany would not accept any responsibility for the War. In 1923 the legal scholar Hermann Kantorowicz put in a memorandum to the Reichstag ‘War Guilt’ committee, showing that three quarters of the published documents from 1914 were false, and even the ‘good German’ Gustav Stresemann tried to stop him from getting a Chair, and suppressed the report. This is all understandable, because Germany did face a war indemnity, ‘reparations’, designed to cripple her for two generations, and to suggest that she had caused the War counted as treachery. But so did criticism of the army (and the fourteen-volume official history, besides being incomplete, was almost free of it). Exposing the reality was left to a writer such as Remarque. For Germans the War had ended in defeat and disillusion. It had been a four-year epic of sacrifice, and there had been spectacular successes, from the capture of Russian Poland in 1915 through Caporetto in 1917, when the Italian front imploded, to the March Offensive of 1918, which destroyed the British Fifth Army. German generals had a panache lacking on the Allied side, almost to the end, and it is notable in All Quiet on the Western Front that there is very little criticism or mockery of generals, let alone officers, who come off well – understanding and humane. The Germans shot far fewer of their own men than did the British. When the armistice happened, attempts were made to imitate the Russian Revolution in which Soldiers’ Councils had challenged the authority of their officers. Far from being revolutionary, the German Soldiers’ Councils voted for Generalfeldmarschall von Hindenburg to be their overall president (he declined). Even so, some 25,000 German prisoners of war did join the Red Army. The end of the War saw bitter political recriminations: the Left blamed the Right for starting it, and the Right blamed the Left for stopping it, for giving the fighting troops a ‘stab in the back’. This civil war was always latent in the Weimar Republic, and it flared up again when the Wall Street Crash ended properly democratic government (in 1930: thereafter governments ruled by emergency decree). The civil war culminated in the victory, in 1933, of the Nazis. It also resulted in the emigration of Erich Maria Remarque. All Quiet was one of the Nazis’ burned books.